Chocolate Covered Cherry Muffins. 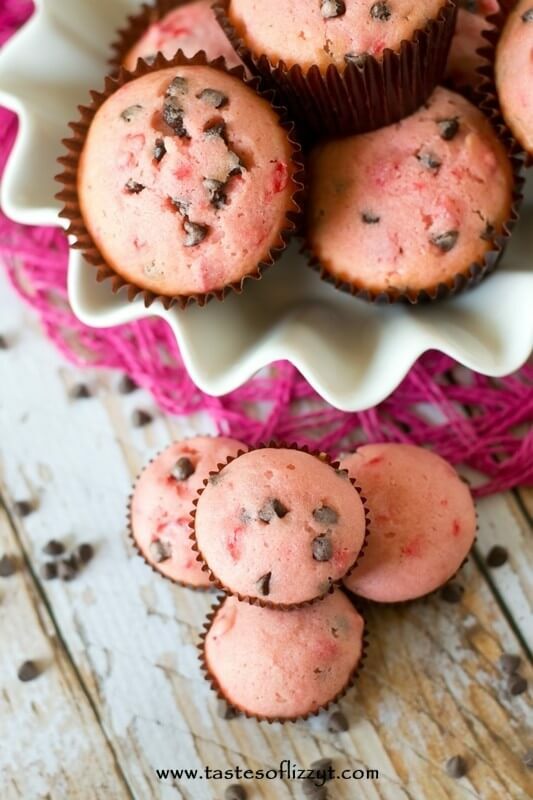 Moist, soft, pink muffins filled with maraschino cherries and mini chocolate chips. drizzled with a milk chocolate glaze. Can you believe we are halfway through October? I know I can’t wait for all the holiday festivities to begin. Maybe they have for you already- or maybe you like to wait until it is closer to Thanksgiving to start decorating and celebrating. We all love the holidays, but our family always likes to get an early start. And by early start, I mean November 1st. We listen to Christmas music, start the holiday baking (like these chocolate covered cherry muffins) and my brother and sister ask when we get to put up the tree. I just love every minute of it. But back to October now. October holds the first full month of fall, Columbus Day, Halloween, and Breast Cancer Awareness Month. We’re honored to join with a group of fantastic friends to promote Breast Cancer Awareness Month by sharing with you a pink recipe. And after thinking through some of our other pink recipes that we’ve posted, like this one and this one, we thought about our most-loved cherry quick bread. So I thought of this idea, cute little mini muffins topped with mini chocolate chips and dripping chocolate. …….And mom had this come to mind…normal sized cupcakes with a cute little cherry on top. These amazing little cupcakes originated from our cherry bread that we shared with you early this year. We’ve always wanted to make it into chocolate covered cherry muffins. Why? Because my dad loves chocolate covered cherries so much and I just wanted to make that pinkalicious cherry sweet bread again. These cute little cherry cupcakes are so simple and fun, you’ll want to make them every day! Simple cherry quick bread batter with mini chocolate chips inside, scooped out into little cupcakes and baked into little bites of sweetness. And that chocolate glaze on top? We melted together milk chocolate chips and heavy whipping cream to make a rich but thin chocolate layer, super easy to spoon onto your cupcakes. All that’s left now is a little cherry to go on top, if you’d like! Drain the maraschino cherries. Coarsely chop the cherries in a food processor or with a knife. Gently fold the cherries into the batter. Place 16 cupcake liners in a cupcake pan. Spoon the batter into the paper liners, filling 3/4 of the way through. Bake at 400 degrees for 5 minutes, then lower the temperature to 350 degrees and bake for an additional 13-15 minutes. A toothpick inserted in the center of the muffins should come out clean. Allow the muffins to cool for 5 minutes, then remove them from the pan and place them on a wire rack to cool completely. To make the chocolate glaze, place the chocolate chips and heavy cream (or coconut oiin a microwave safe bowl and melt them in the microwave for 30 seconds. Stir the chocolate chips and continue to microwave them in 20 second intervals, stirring inbetween, until the chocolate chips are melted smooth. Once the muffins are cool, spoon the glaze on top of each muffin. Place a maraschino cherry on top to decorate the muffins, if desired. Allow the chocolate to set and store the muffins in an airtight container. *I often add an extra teaspoon of vanilla or almond extract to the bread batter (along with the wet ingredients) for an extra boost of flavor. *Many maraschino cherry brands come without red dye in the cherries. If you pick up a jar like this, your bread will not be pink. If you want pink bread, be sure that the cherries you use actually have red coloring in it. You can always add additional red coloring if you want the bread to have more of a pink flavor. *You can make mini muffins, if desired. Simply bake them at 350 degrees for 12-13 minutes. This recipe would make about 32-36 mini muffins. Julie and Maddie these muffins are adorable! Love that cherry on top 🙂 What a wonderful cause to bake for! What a perfect Pink recipe! These lil muffins are so cute, and I am dying for that melty chocolate on top. Yum!! These look amazing, ladies…..and perfectly pink for Breast Cancer Awareness! These look amazing gals! I love cherries and chocolate together.